Increasing security at your organization is a chief reason to launch an ID card program. Make sure to have clear strategies in place to prevent individuals from gaining unauthorized entry into a building or secure area. Taking preemptive measures will greatly reduce the likelihood of security threats, and ensure the safety of employees, members, or volunteers. Will employees need to visibly display badges? Will ID cards need to be displayed above the waist for enhanced visibility? Should visitors or contractors be required to wear badges? These are a few examples of questions to ask as your badge program unfolds. Many low-security organizations do not need to go to these extremes but some go as far as scanning all employees in as they approach an entrance door. Read on to learn more about securing your entire ID card system. Some printers come with optional physical hardware locks to prevent theft and unauthorized use. For high-security environments a hopper lock is recommended to prevent unauthorized individuals from gaining access to the cards. All AlphaCard’s ID Suite software versions feature advanced security settings to protect both your database and card design. These features include file password protection, user authorization, and the ability to customize user group access levels. For example some users may be authorized to enter or updated card holder records, but not have the ability to print. Always change the default password to one that’s unique and only accessible by specified company personnel. A strong password will protect sensitive cardholder information from being compromised or leaked. Adding ghosting or watermark effects into your ID card design is a smart way to add a barrier against fraudulent duplication at an economical price. Watermarks are almost translucent in their appearance and are applied by hand or by specialty watermark-capable printers. Depending how the ID card is held and where the light hits it, you can see the watermark in certain angles. Watermarks amplify the level of visual security to your ID cards, and can be customized for even stronger protection. Ghosting, on the other hand, is a type of design that produces a faint image of the card layout on top of the original layout. Again, this is a measure to improve visual security. AlphaCard ID Suite offers ghosting and opacity effects that can easily be added to any existing card template & printed without any additional expense. An economical yet practical security option, hologram stickers are self-adhesive patches that are applied to the card after it is printed. You can select from an assortment of full designs, which add to the durability of your ID badges as well. You can also get smaller stickers, and customize them with your logo. 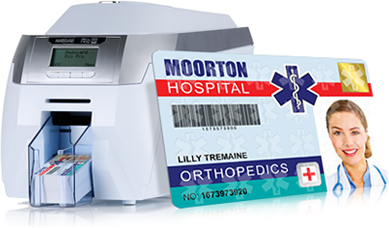 With hologram stickers, you won’t need lamination modules, which helps to decrease the upfront cost of your ID card system. For organizations on a budget, hologram stickers or overlays are an optimal choice for added visual security. A HoloKote image is similar to a hologram, but is instead printed as a watermark image on the surface of the ID card as part of the printing process, making it more difficult to duplicate. Available exclusively on Magicard printers, the hologram- like feature doesn’t require any additional equipment or supplies. Standard HoloKote watermark designs are built into all Magicard printers, and can be printed 24 times across the surface of each card, or just a single small image in one quadrant. Learn more about Holokote. 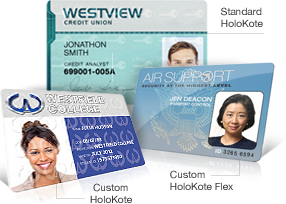 Depending on your security needs, a customized HoloKote may be a better option as it allows you to emblazon a unique watermark or logo onto the surface of the card with the Holokote watermark technology. The custom design is virtually impossible to replicate, since it requires a secure key to access. 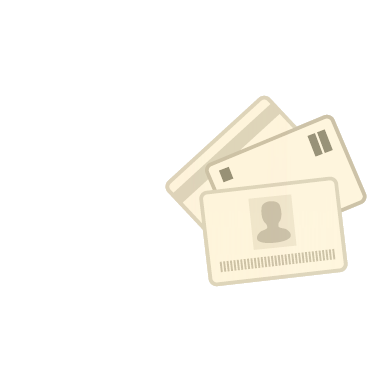 Additionally, if you remove this key the holokote image will not print, so any card that is made by an unauthorized user will be immediately identifiable as fraudulent. Customized HoloKote technology is only offered on the Magicard Rio Pro printer. Although all printers apply a clear overlay to every ID badge as part of the standard printing process, some companies want to add yet another layer of protection, through lamination. This ensures a longer life-span of your ID cards and shields them from tampering attempts. AlphaCard features a wide selection of laminating printers, all of which promise maximized card durability and security. There are multiple types of single and dual-sided overlaminates to choose from, including clear and holographic options. The overlay is applied to the card after the initial printing phase. The good news is that many higher-end printers allow you to easily upgrade to laminated cards by adding this lamination module to your printer in the future. We’re here to make the decision-making process easy when it comes to ID card security. We’ll evaluate your ID badge needs and budget to help you determine the most the feasible security features to add to your system. Give us a call or send an email to get more in-depth information on security. We’ll point you in the right direction.